A little something new and refreshing for breakfast! 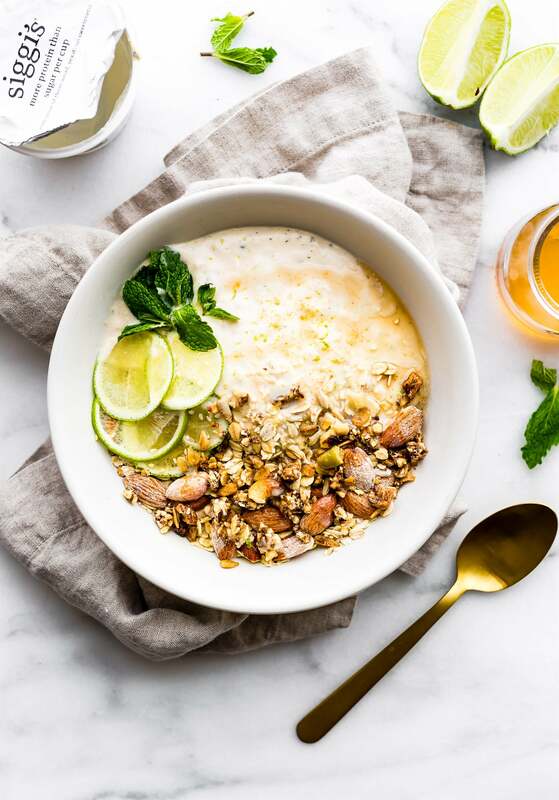 This Zesty Tropical Yogurt Overnight Muesli recipe is the perfect make ahead breakfast bowl! Gluten- free, nutrient rich, and made with Icelandic-style skyr coconut yogurt for a protein boost! Overnight Oatmeal lovers, this one is for you! Okay and selfishly me too. 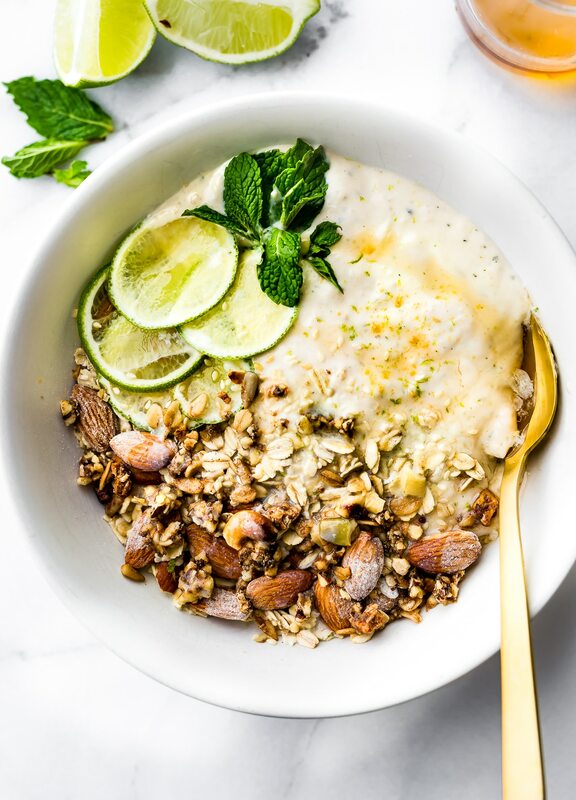 Zesty Tropical Yogurt Overnight Muesli Bowls! WHAT??? Yes, I said overnight muesli, not oatmeal. It’s a thing. Yogurt and Muesli are so common in Europe, and I think it’s about time we make room for them in our American breakfast bowls. Don’t you think?! So what exactly is Muesli and why is it so darn tasty (and NOURISHING) for ya? Oh good, glad you asked. You see, “Bircher” style Muesli was actually developed around 1900 by Swiss physician Maximilian Bircher-Brenner. He created this raw oats/dried fruit mix for his patients. Soaking oats and fruit in yogurt is the traditional way to make breakfast muesli. Think of it as “pumped up” oatmeal, but not cooked, and cold. Basically it’s “overnight oats” but soaked in yogurt. Oh but wait, it gets better and will sound better in a minute. Hang with me here. Today we’re taking this whole overnight muesli bowl concept to a new NUTRIENT dense level. Less sugar, more protein, and a boost of good gut health! How? Well, soaking gluten free oats and seeds overnight makes them easier to digest. You see, certai plant base grains and beans contain phytates , which can interfere with digestion because we lack the enzyme phytase to break them down. But soaking these legumes, nuts, and grains (like oats in the muesli) helps breaks down the phytates, making it easier for us to digest and therefore better nutrient absorption. Yes, that’s one AMAZING gut health factor. But here’s where the “PUMPED UP” part comes in. 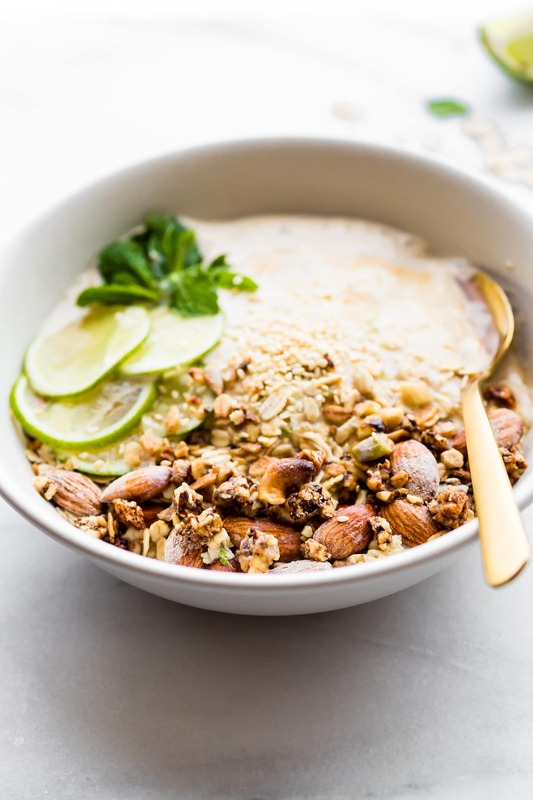 We’re going soak that muesli in a tropical creamy blended yogurt mix using siggi’s coconut yogurt, banana, and lime. That’s a mega mix of PROBIOTICS, CALCIUM, POTASSIUM, and VITAMIN C ya’ll! Oh and the mint leaf topping, yes, that’s to also aid in digestion. 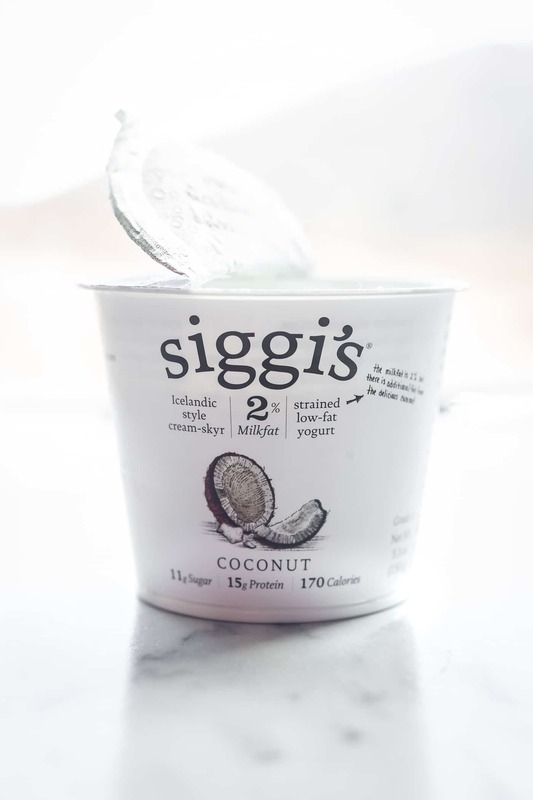 Siggi’s is a traditional Icelandic-style skyr. It’s the perfect tool for boosting recipes with protein! How? By incubating the milk (whole or non-fat) with live active cultures. Then they strain the whey and excess water to make it thicker and more concentrated. This results in 2x as much protein versus regular yogurt. Oh gosh, you all know my love for siggi’s. Remember my love for carrot cake protein pancakes? Ya, the love keeps getting thicker and thicker! Like a good Icelandic-style skyr YOGURT! Haha, puns aside, today’s yogurt overnight muesli recipe (with siggi’s) is focusing on the probiotic love! Do you see where I am going with this? Don’t worry, the nerdy nutrition side of me will be happy to tell you! This tropical yogurt blend (with siggi’s coconut yogurt) is the KEY COMPONENT to helping you maximize nutrition! 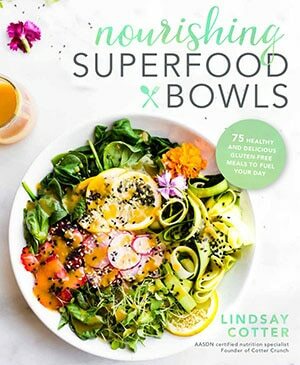 It’s going to help you really ABSORB all those nutrient dense foods you’re putting in your muesli bowl! Which makes it the perfect make-ahead healthy breakfast bowl, not to mention extra tasty too! 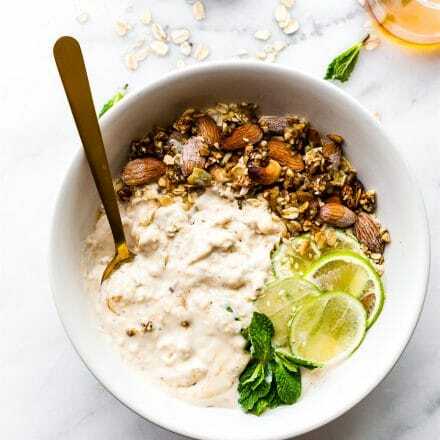 Make this make-ahead yogurt overnight muesli breakfast if you’re pressed for time in the morning. It’s lifesaver. I mean gut saver. I mean…… you get my point. Move over overnight oats, overnight muesli bowls (with tropical PROTEIN PACKED yogurt) is the WAY TO GO! The perfect make ahead breakfast. 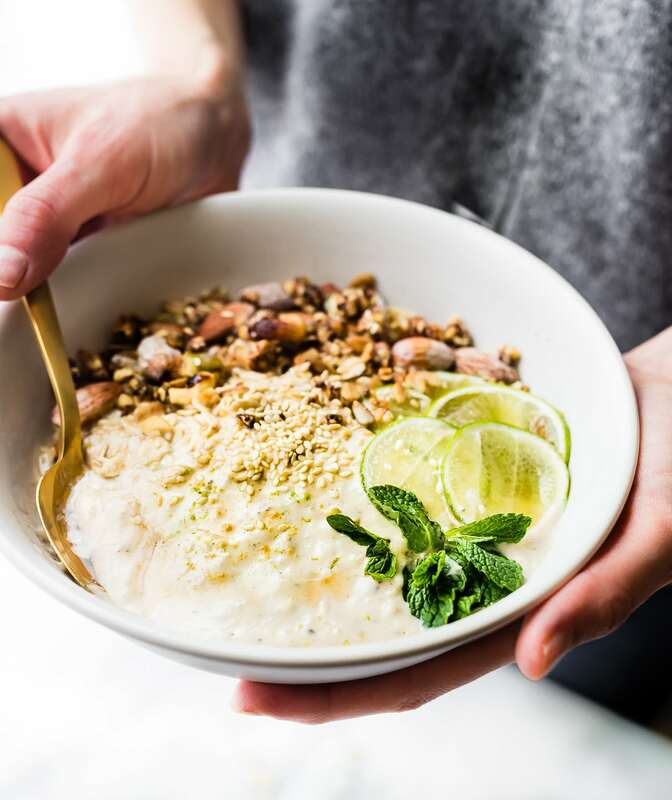 Gluten-Free Tropical Yogurt Overnight Muesli Bowls are protein rich overnight oats with yogurt, fruit and nuts. 1/4 to 1/3 cup gluten free nuts/seed granola mixed or to top. Coconut milk or almond milk to top once soaked. First make your gluten free muesli mix. Toss gluten free oats , protein powder, seeds, almonds, and 2 tbsp granola together in bowl. Set aside. Next make your tropical yogurt mixture. 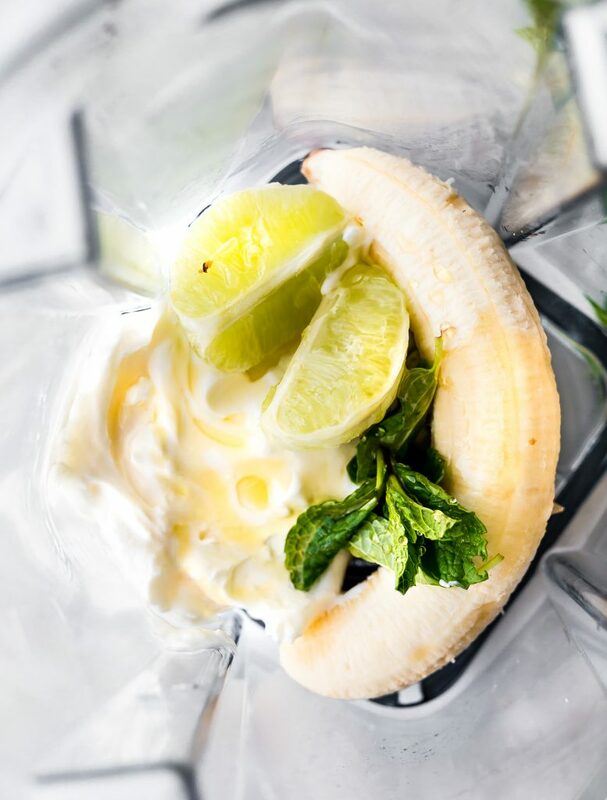 Blend together banana, coconut yogurt , coconut oil, spices, lime, and mint/honey. Blend until creamy. Adjust sweetness if desired. Pour over your homemade muesli mix and let it soak overnight or for at least a couple hours. Remove from fridge and pour a few tbsp coconut or almond milk over each bowl. 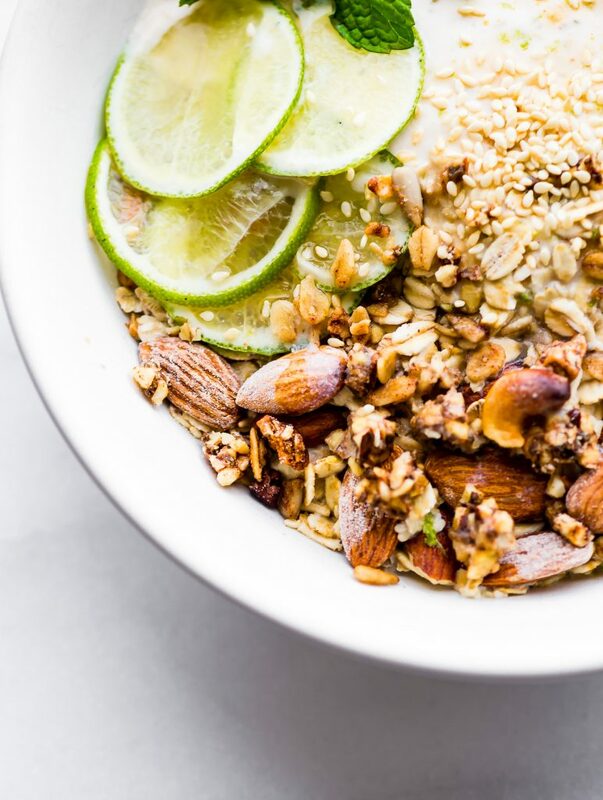 Top each bowl with 2 -3 tbsp of gluten free granola, lime wedges, lime zest, mint leaves, and and toasted sesame seed if desired. Feel free to add coconut flakes on top! If you don’t have protein powder, you can use coconut flour with a bit of vanilla or a omit it. In a hurry? 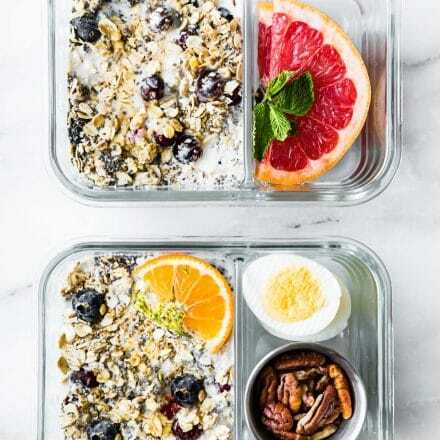 Just place the yogurt overnight muesli in jars and grab and go in the morning. Nutrition per bowl will vary. Depends on your granola. Nutrition shown is per bowl, minus honey. Okay, so I have to know. Who here has tried the real MUESLI deal? MUESLI bowls with creamy European yogurt? Gah… I feel like we need to move to Switzerland or Iceland! Haha! Yum to all! 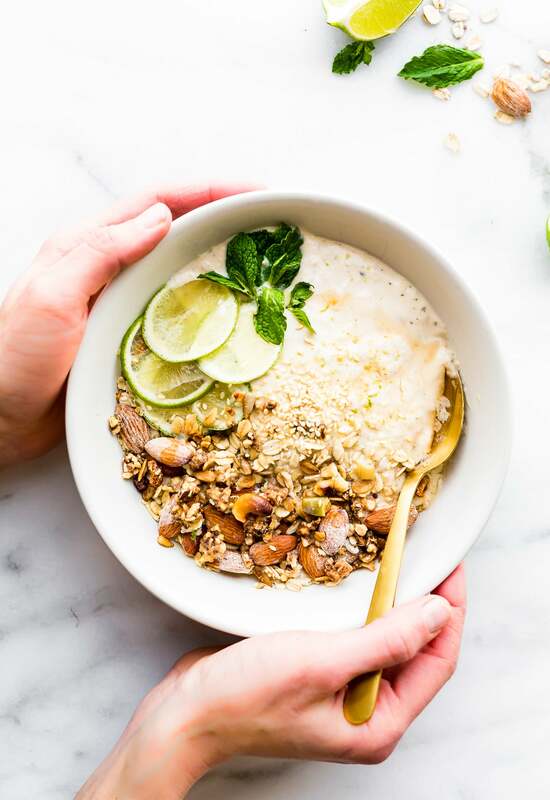 This Tropical Yogurt Overnight Muesli recipe is sponsored by my friends siggi’s dairy ! Thankful they supply us with such nourishing real food! Keep up with the siggi’s on social media. 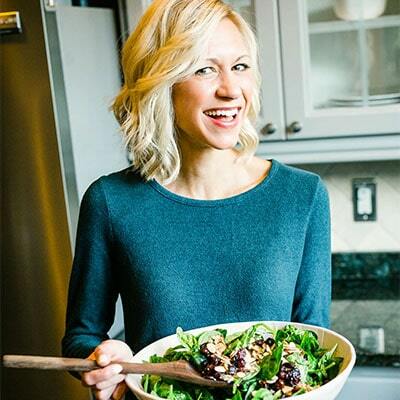 Facebook, Twitter, Instagram, Pinterest They are full of recipe inspiration! I adore Siggi’s! Need to try this bowl this week. Almost 100 here this week! Tropical paradise in a bowl right here! I love adding yogurt to my overnights oats, and am definitely digging this overnight muesli sitch! This bowl looks so perfectly well balanced and absolutely mouth-watering!! thanks friend! come over for some! oh i bet! what’s your favorite flavor? Love love love Siggi’s! And this bowl is a great way to jazz my yogurt life up! Pinning to try! Great! Let me know what you think Suzy! I love when you get all zesty on me. Based on your recommendation, I’ve been trying Siggi’s for Ave. It’s not sweet enough for me, but I adore the lower sugar content for her and she doesn’t seem to mind. I’m always zesty for you! Are you feeling better? Ps have you tried the 4% cream top? They have a rhubarb. I kinda think you’d like that! I am feeling better. Thanks for asking. I don’t think I’ve seen the cream tops at the store. I’ll keep a closer eye out next time I go. i just saw Siggy’s in the store!! I need to get some so i can make this! Would love to know what you think Deanna! I’ve gotta try this soon! It’s a must make for sure! 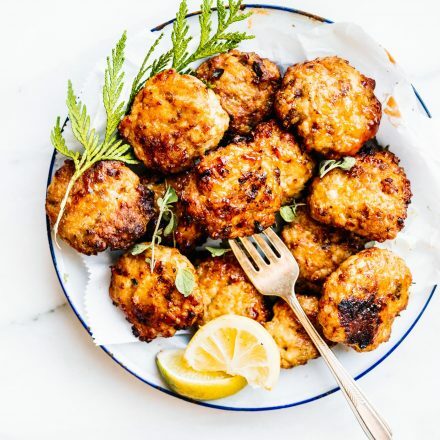 Make ahead and protein packed? Talk about a win win! 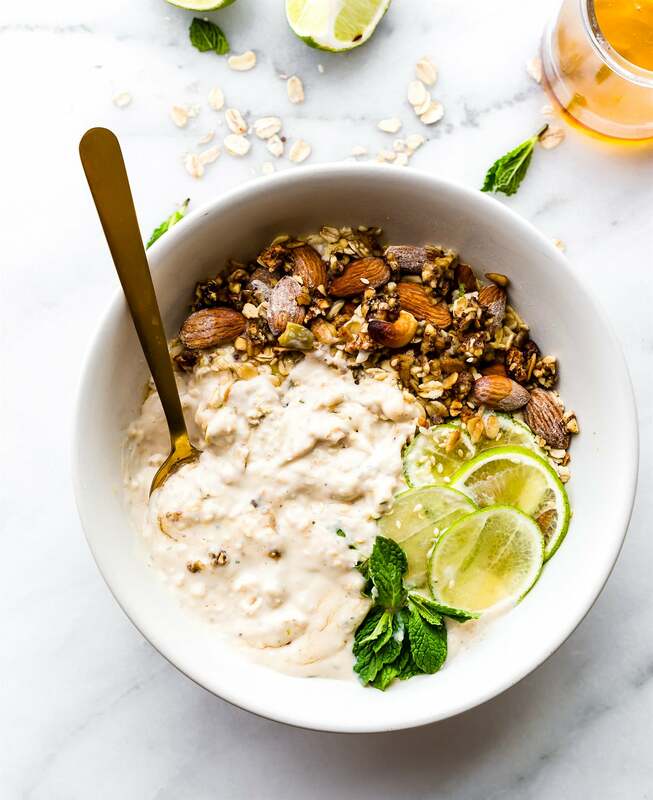 And YES I agree that it’s time we made room for Muesli – I fell in love with it when I was in Italy and was so sad when I came back to the states and it was still in the shadows of oatmeal! A win-win definitely! I’m totally in love with it too! Never made homemade muesli before. This bowl looks too pretty to eat. I’ve been craving tropical flavors recently. I found this recipe just in time– it looks perfect! I love Siggi’s and homemade muesli sounds amazing. I’ll be making this soon! oh yea! keep me posted alyssa! Love this Lindsay! I’m a huge fan of muesli and yogurt. I don’t normally soak it overnight though. Gonna be trying that tonight! awesome! let me know if you do Deb! This looks simply delicious and perfect for spring! I’ll have to add this one into my breakfast rotation, I love muesli and it’s a regular for breakfast. Me too Jennifer! Hope you’ll try this! Who needs a tropical island when you have this?! 🙂 Sounds like such a refreshing start to the day! And yes, love starting my day with this! This almost looks to beautiful to eat! I am a huge fan of siggi’s, I love the texture, taste and how low in sugar it is! right? the best! so thick too! I love me some siggi’s! 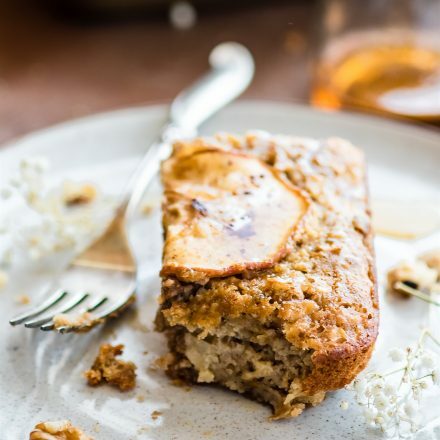 This is perfect for a make ahead breakfast! Looks delicious! isn’t it the best? I’ll save you a bowl! I love this take on overnight oats. The tropical flavors will be a great mix up to my morning routine. for sure! let me know if you try it! Your breakfast recipes have been ON POINT AS HECK lately! And soaked oatmeal is the best…not only for the digestive benefits, but also the easy breakfast! woohoo yea! so glad you approve! soaked is best, for sure! the mint and lime do wonders. Let me know if you try it Casey! Stunning photos!!! Love me some siggi’s! 🙂 Muesli reminds me of my time in Austria! Let’s go back to Austria! oh yogurt, how I miss thee, let me count the ways 🙂 you have such cool flavor combos that I’d never think of! I had no idea that soaking oats and other foods overnight makes them easier to digest (but it makes sense)! I really love Siggis too!!! It’s so delicious and creamy! Need to try the coconut flavor! Oh yes, you need to try it! So good! I love the tropical flavors in this bowl! So refreshing and nutritious! A great way to start your day! Thanks Sonali! Would love to know if you try it! Yum the flavor in this sounds amazing. I need to find me some of this coconut yogurt! Yes you do! It’s so delicious! YUM. I’m all about anything that can be prepped ahead lately! I don’t think I’ve tried Siggi’s before. Oh you should definitely get some siggi’s and make this! You’ll be hooked! I got really excited there for a second when I saw “Siggi’s coconut yogurt” 🙂 Someday! Brilliant recipe though – I just love that tropical blend! Maybe they will soon! I think that would be great! This would be the perfect summer breakfast. So refreshing! Nice and Delicious Recipes discussion in this article, I hope Every people love it very much. I like all dishes which show in this post thanks for sharing with us. 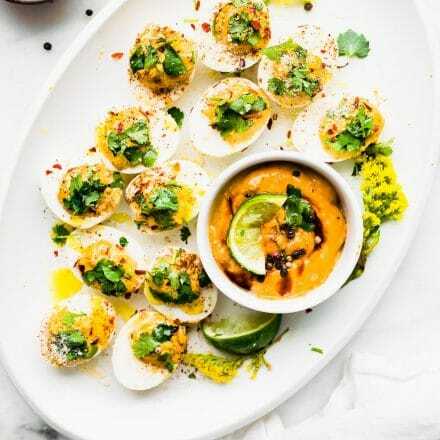 I always come here to learn and making the process of such types of delicious food which you have posted in your post, your all dishes and its making process is really very helpful during making time, keep it up. well, your all dishes and its making process is very interesting and yummy, i will try to make this product at my home.